and of course, the seeds should be qualitative and decontaminated. On the windowsill too little light for seedlings have hatched seedlings supply of nutrient-very limited. Need for intensive organic growth in the islands, but the plants obtained from mineral soil only in the islands, and organic plants in the islands must develop through photosynthesis. On the bright light in the resulting pieces of photosynthesis is active, organic forms in the islands 10 times more than burnt during breathing. In such conditions, seedlings of most crops are ready for swordplay after 1-1.5 weeks after emergence. A day March 1 is only 10 hours and 40 minutes, 1 April - about 13 hours. That is on the windowsill very little light for vegetable seedlings, so you need supplementary lighting. Not so fast growing seedlings There are two strategies growing sprouts at home: to create the necessary conditions for seedlings; slow down the growth of seedlings with additional factors to avoid the negative consequences of low light and short days. In the first case you can not hurry with transplanting as seedlings in good conditions is growing rapidly. Can wait until spring, but even in spring in most parts of Russia without supplementary lighting you can not do. With lamps should bring illumination to a level 6-8 thousand luxury and ability to optimize other conditions (temperature, irrigation, mineral nutrition, humidity, etc.). Result - rapid growth, disease resistance and high yield potential.Thus, the first strategy is that by means of good conditions to grow the seedlings as soon as possible. If you follow this strategy, in the middle lane the earliest seedlings: celeriac and stemmed, eggplant and pepper (for unheated greenhouses) should be planted in the first - the second decade of March, tall varieties of tomato seedlings for greenhouses, leeks and onions - in the second or third decade of March, early cole crops - in the third decade of March. Seedlings of all other crops, including tomatoes open ground, begin to drop in April. SIC! The literature often recommend planting seedlings in the winter for a number of crops - almost the end of January. 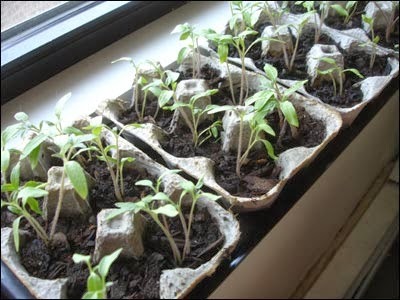 Many gardeners adhere to these recommendations, and in February, on a window sill can be seen not only peppers and even tomatoes. Where are these terms? They came from the practice of greenhouses where the end of January in specially equipped nurseries begin to grow seedlings for planting it in March in the greenhouse with the technical heating. The extension of this practice in amateur vegetables is not justified. In unfavorable conditions, growing seedlings artificially stretched, and at the time of landing, we have overgrown plants that a good half of his life spent in a state of light, water and other stresses. Can we expect that it would not affect their productivity? Of course not! second strategy is to ensure to start growing seedlings early and avoid the negative effects of low light and short days to slow down an already slow growth of seedlings with additional factors. To restrain stretching can reduce the temperature. For cabbages, for example, in the first few days after emergence is recommended to keep the temperature of 6-10 °. But in practice to regulate the temperature in a city apartment is not easy, therefore introduced another limiting factor - watering. Recommended to water the seedlings rarely and only when it begins podvyadat.conclusion. What makes sense to start seedlings early, and then use various tricks not to give it to grow? Especially as the potential yield from seedlings grown in the shortest possible time in good conditions will be higher than that of older seedlings, which grew long time in adverse conditions. Is not it better to wait a long day, make up for the lack of light supplementary lighting, optimize all other terms and conditions as soon as possible to get the seedlings with a high yield potential? Of course, this is the best way, but it requires training.